Exactly six weeks from now, around this very time (5:30 am), I’ll be wrapping up my morning race routine with one cup of coffee and some toast. Then, I’ll put on my Zoot tri suit, grab my start bag and head to the race venue. On November 16th, I will be doing my first, full Ironman race in Tempe, Arizona. This morning, I want to share more about my training experience. I have learned so much about myself and life in general during the process. A year ago, I sat at the computer, my stomach was churning. I knew that once I hit “Submit”, I would be registered for Ironman Arizona. It was nerve wracking! You have to register a year in advance to secure your spot in this coveted race. It always sells out in minutes. Click! “Congratulations! 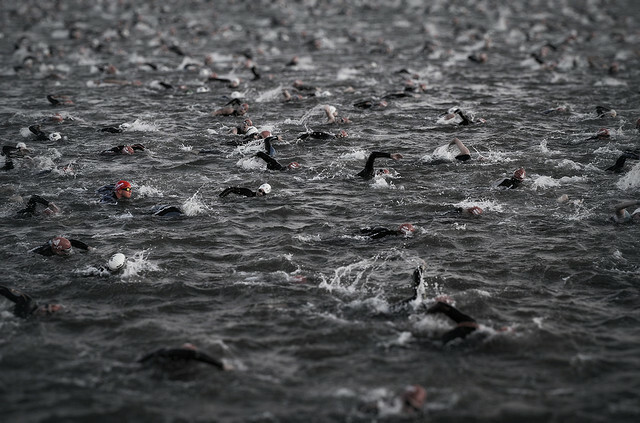 You are now registered for Arizona Ironman!” That was too easy. Time to start training. I don’t like training in the winter. The cold and I don’t get along very well. So, I started doing lots of indoor activities, mostly racquetball at the time. Occasionally, I would run or bike, even swim a few times. The key for me was to get moving and stay active through the winter. Once spring hit, I was able to get outdoors more. In March, I signed up for DFW Tri Club and started training with them once a week. But, as the spring turned into summer, I knew I needed a more focused training regime designed specifically to get me ready for Ironman. Through the recommendation of a friend, I hired coach Trevor. On June 2nd, six months before Ironman, I started training everyday for Ironman. I want to finish (1) within seventeen hours (2) uninjured (3). My coach said there are two types of people who do Ironman — those who race and those who survive. It should be clear by now which one I am. Over the past few months, I have really enjoyed seeing the benefits of training. Sure, it’s hard work and takes a lot of time, but if you work the training, the training works you. I have seen this first hand. My bike times are faster. My run times are quicker. My swims are stronger. All measurably so. But even as you make progress and get stronger, you still have to fight the Ironman mental game. They say that running a marathon is 90% mental and 10% physical. For Ironman, it’s 90% mental and 10% mental. The swings between “I can do this” to “What the heck was I thinking” are drastic. Sometimes, an injury will set you back or you bonk on a long ride, and then the doubts start singing in your head. I asked my coach about this and he said something very important: The hardest part of Ironman is getting to the start line. To get the start line, here’s how I’ve changed my perspective about the race. The thought of doing an Ironman–2.4 mile swim followed by a 112 mile bike ride followed by a 26.2 marathon, all in one day–is daunting. That’s a massive goal. It can be overwhelming to look at it as one big goal. Another great piece of advice from both my coach and my wife is not look at the race as one big goal but as many small goals. For the swim, once that horn blows, your goal is simple: swim to that first buoy. Woo Hoo! I made it. Next goal, swim to the buoy. Yeah, another goal accomplished. Eventually, you’ll finish the swim. On the bike, there are three 37.5 mile loops. That’s a comfortable Sunday ride for me. I can do that. That will be my goal. I will bike 37.5 miles. Awesome, finished 37.5 miles! Next goal, 37.5 miles. Killed it! And then another goal, 37.5 miles. Bike ride finished. Then, the run, my weakest event of the three. I will not look at it as a marathon. I don’t have to run 26.2 miles. Instead, I will just run one mile. Then, celebrate that mile accomplishment. Then, run another mile. Then, run a mile. Just a mile. Run another mile. I do this 26 times, each mile celebrating the goal of running that mile. But, Russ, it’s the same. No, it’s not. Not in my mind. They are not the same. Short, achievable goals are… well, achievable. I have experienced this in a few areas of my personal life. When I made my first movie, I was a bit naive (kind of like my Ironman experience). I wasn’t sure what to expect, so I broke it down into many, small steps. First, I needed to find a story. That was my focus. My only focus. After finding the story, the next step was finding funding. Again, that was my only focus. After the money, I needed to find a team. Next, we needed to shoot the film. Next, we needed to edit the film. Etc. Etc. I didn’t look at the entire process, only the next step. Had I truly known the extensive amount of work it was going to take to make a feature film, I could have easily talked myself out of it. Today, having done three feature films, it’s a daunting task when you look at the entire goal. So, don’t. What goals do you have in your life that seem too big to accomplish? Why don’t you figure out the first step towards that big goal, and focus on accomplishing that one small goal first. And see what happens! You might be surprised. Do not despise these small beginnings, for the Lord rejoices to see the work begin (Zechariah 4:10). A great read Russ. You have definitely unlocked one of the secrets to life itself…”taking it one step at a time.” Congratulations ahead of time for all the success you will have in the upcoming Arizona Ironman. your dreams fulfilled. We are Russ Pond fans at our house! God speed my friend!